The S&S 1910s tea gown pattern generally receives excellent reviews and is very similar in cut to many of the wedding dresses we’ve seen. The sleeves appear to be a bit shorter than most examples, but it shouldn’t be too hard to lengthen them or to add lace undersleeves. You could also lengthen the skirt to form a train if desired. The one slightly tricky thing will be filling the neckline, as its much too low for a daytime wedding. The easy way to fix this? With a guimpe! (Note to self – do a guimpe tutorial). 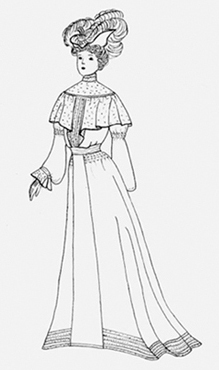 This is perfectly historical, as I’ve found quite a few 19teens wedding descriptions that make note of the guimpe, and there are examples of 1910s wedding dresses that were worn with guimpes for the wedding, and without for evening wear after. Note how similar the blue version is to Elizabeth Boyd’s wedding dress. Just make it in luscious midweight silk satin over a lace bodice, add tucks in the skirt and pintucks on the sleeves and a collar. Want something with a fuller blouse? 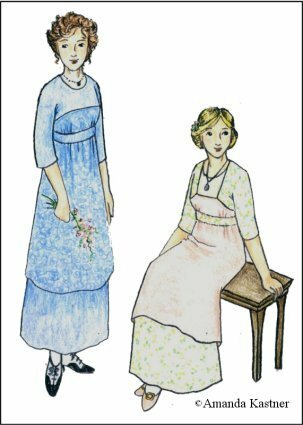 Also from Sense and Sensibility is the 1914 afternoon dress pattern. 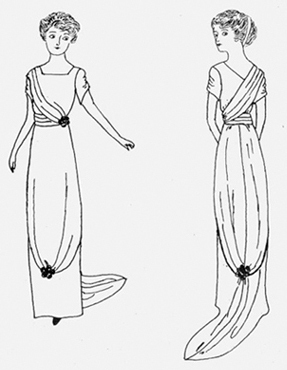 Yes, it’s a few years later than our ideal year, but the pattern is quite simple, and does match the shape and silhouette of some extent 1911 gowns, so isn’t entirely out of the question. 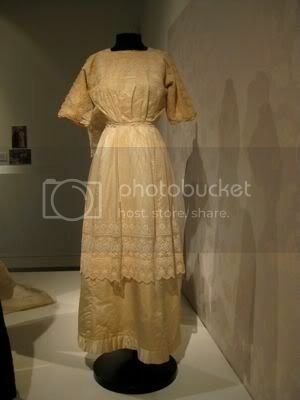 And wouldn’t it be perfect for this dress from the I Do exhibition. Once again it needs a guimpe, but couldn’t you just imagine it in satin with a lace and tulle overlay? Swoon! To update this dress 5 or 6 years, reduce the skirt gores slightly, reduce the blousing in the bodice, change the sleeves to long slim lace sleeves under mid-length straight sleeves and remove the bodice ruffle. 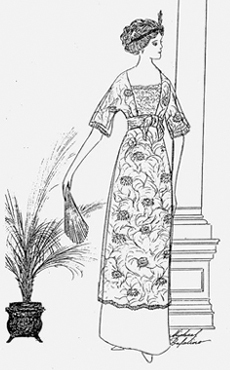 The original 1910 pattern even suggested it be made up in marquisette! You could also easily work lace into the bodice, and there are lots of places to trim with Irish crochet buttons. This one is comes with a lace cape, and an option for a high neck – very helpful for a wedding dress! It is, however, a style usually seen later than 1911. Not quite so worried about historical accuracy? And used to working with modern patterns? 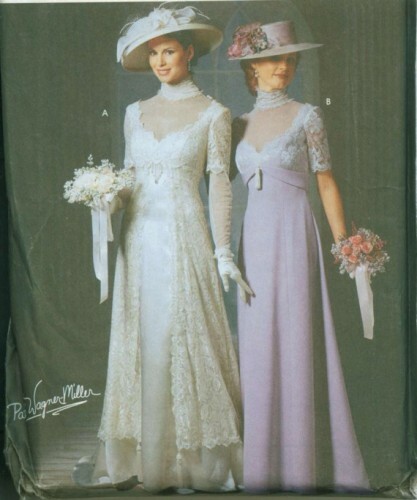 You could try to find a copy of Simpliciy 9716, their ‘Edwardian’ wedding gown. It does have the high neck and options for long sleeves already built in, but you’d need to make extensive adjustments if you wanted it to be accurate (change the sleeves from set-in to kimono, the neckline from sweetheart to round, square, or crossover, and the back fastenings from zip to hooks or buttons at the very least). Probably much easier to stick with the more historical patterns! There you go! Lots of options! Just pick the one that matches your inspiration image best, and go with it! Anyone made a dress from any of these patterns and want to show it off? folkwear.comWhat a wonderful range of pattern makers! Thank you kindly! I don’t know if you approve of Folkwear patterns – they are less date-specific. I once made their Edwardian Bridal Gown – I remember the strain on my back, inserting what seemed like miles and miles of lace! The only patterns I don’t approve of are the ones that don’t go together properly and never fit anyone! (OK, I can’t say I love the completely historically inaccurate, ridiculously hard to make, Big 3 “historical” patterns). I just forgot about Folkwear doing this write up – somehow I thought they had gone out of business. The Edwardian Bridal gown would be an excellent pattern option – you’d want to make it less frilly and fluffy for 1911, but the basic shape is spot on. Thank you for posting it. I’m so glad you are posting these. I am planning a dinner party in February to go in conjunction with the release of a friend’s book. His book is set on the Titanic, and I hope to complete a costume to wear at the party. I see these patterns as great jumping off points to create the perfect gown, once I figure out what that is! If anyone has experience with any of these patterns, I’d love to hear feedback. Or if you have suggestions for colors and materials, that would be great! With the 100th anniversary of the sinking of the Titanic coming up next April, I imagine lots of people would love to recreate their own gown from that era. I’m hoping the anniversary (though a tragic event in history) will spur interest in this era again for its clothing. I think Jennie of Sense and Sensibility developed her patterns after the release of the James Cameron Titanic movie. I remember how so many people were making the dresses from that movie. It was fun to watch! I used the S&S Tea Dress pattern for my wedding dress. Since we weren’t going for historical accuracy, I didn’t change much about it. It was really foolish of me to pick a brand new (to me!) pattern for my wedding dress, but it went together very easily! My biggest problems were with hemming the silk chiffon. Oh lovely! I bet it was gorgeous! 1910s was my 2nd choice for my wedding dress inspiration, but Mr D really wanted a more informal wedding, and the wedding venue was 1920s, so I went early 1930s. Hemming chiffon is a pain! I must do that rolled hem tutorial I have been promising. Like most original patterns from that era it was somewhat challenging, but once I figured out what the markings were it went pretty quickly. If I remember correctly the instructions were very minimal and text only. I think it was standard to not include an instruction sheet in this era and have written instructions on the back cover. You’re version is gorgeous: that era suits you so well! And it’s lovely to see it made up as an adult dress. Good to know it is basically an original pattern, with minimal instructions. I’m surprised that a pattern of that era has any instructions at all: none of my pre-20s patterns give any guidance whatsoever. And totally appropriate to say that you are planning to make add a 1910s pattern to your range! 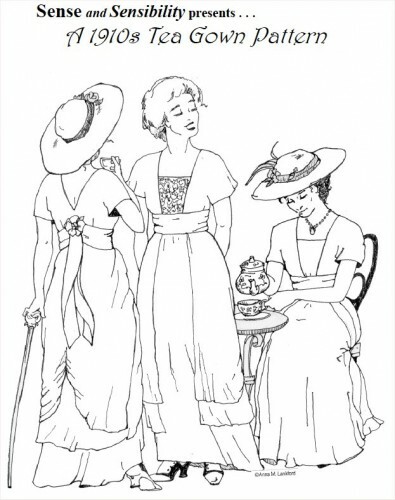 I find the variety of patterns from that era is very limited (so many variants of the tea dress and not a lot else) so it would be great to have something else. I also see a huge gap in patterns between 1900 and 1910 – there are a lot of early 1900s, and a lot of ‘teens, but so few transition gowns, which is really what 1911 is. I agree- I have sewn several Past Patterns Attic Copies and a few Folkwear patterns, but in general it’s hard pattern pickings for this era! I just got the S&S Kimono Dress so am excited to try that one out as well. Thank you so much for all the pattern options. I had not known there were so many. Overall you have given me way more than I had ever hoped for when I wrote. I plan to get started as soon as my DIL’s dress is done which is hopefully soon. I’m not sure what I’ll do with it once it’s made but it is nice to have the freedom to make it exactly how I envision it, without the input of a potential wearer. I’ll be sure to send you a pic to show how much you helped. Being rather taken with ‘Downton Abbey’ at the moment and their gorgeous dresses. I was looking at the S&S pattern for a summer dress. with the 2 tier look It could be made to look ‘modern inspired by history’ kind of dress. only I didn’t translate anything to english yet. I found a site, historicalpatternco.com. Arn’t these the titanic patterns?